Link their individual achievements and make a meaningful contribution to the attainment of the institution’s Vision and Mission. Promote individual and team growth, participation and commitment. In line with this Philosophy, DepEd implements a Results-Based Performance Management System. It is a shared undertaking between the superior and the employee that allows an open discussion of job expectations, Key Results Areas, Objectives and how these align to overall departmental goals. It provides a venue for agreement on standards of performance and behaviors which lead to professional and personal growth in the organization. PART I Accomplishments of KRAs and Objectives – Each employee plays a vital part in the achievement of his/her department’s objectives. At the beginning of the Results-Based Performance Management Cycle, the employee and his/her superior jointly determines goal and measures that will lead to the achievement of the overall departmental goals. After which, weights are assigned to those goals based on priorities. The total of the weights should not exceed 100. At the end of the performance cycle, the employee is rated on the effectiveness/quality, efficiency (including cost), and timeliness in delivering the goals agreed upon. PART II Competencies – The success of the employee in fulfilling his/her role and delivering exceptional performance is dependent on how s/he applies various competencies on the job. The employee is rated based on the effectiveness and consistency by which s/he demonstrates behaviors relevant to the competencies. The overall rating is computed by adding the rating for each competency and dividing the sum by the total number of competencies. Half-points (e.g. 3.5) may be given if the employee’s performance level falls in between descriptions of the scale positions. PART IV Development Plans – The areas where the employee excels and areas for development are both identified. In this manner, the employee’s strengths are highlighted and recognized. Development needs on the other hand are addressed through formal and informal training and development approaches. 2 Unsatisfactory Performance failed to meet expectations, and / or one or more of the most critical goals were not met. 1 Poor Performance was consistently below expectations, and/or reasonable progress towards critical goals was not made. Significant improvement is needed in one or more important areas. The extent to which actual performance compares with targeted performance. The degree to which objectives are achieved and the extent to which targeted problems are solved. In management, effectiveness relates to getting the right things done. The extent to which time or resources is used for the intended task or purpose. It measures whether targets are accomplished with a minimum amount or quantity of waste, expense, or unnecessary effort. It measures whether the deliverable was done on time based on the requirements of the law, orders and/or clients/stakeholders. Time-related performance indicators evaluate such things as project completion deadlines, time management skills and other time-sensitive expectations. Very Satisfactory – performance exceeding targets by 15% to 29% of the planned targets; from the previous range of performance exceeding targets by at least 25% but falls short of what is considered an outstanding performance. Satisfactory – performance of 100% to 114% of the planned targets. For accomplishments requiring 100% of the targets such as those pertaining to money or accuracy or those which may no longer be exceeded, the usual rating of either 10 for those who met targets or 4 for those who failed or fell short of the targets shall still be enforced. Poor – performance failing to meet the planned targets by 50% or below. A Performance Review Committee (PRC) shall be created in DepEd composed of the Undersecretary for Regional Operations, Assistant Secretary for Planning, highest ranking official in charge of personnel management and two representatives from the rank and file nominated by the accredited employee association in the agency as members. The PRC shall decide on the appeals within one month from receipt. Appeals lodged at any PRC shall follow the hierarchical jurisdiction of various PRCs in an agency. For example, the decision of the Provincial PRC is appealable to the Regional PRC which decision is in turn appealable to the National/Central Office PRC. Only in exceptional instances when the decision of the PRC in the central offices of departments may be appealed further to the CSC Commission proper. The decision made on employees’ ratings by the PRC in the local government units maybe appealed to the Civil service Regional Office which has jurisdiction over these units. An official or employee who was separated from the service on the basis of unsatisfactory or poor performance rating can appeal his separation to the CSC or its regional office within 15 days from receipt of the order or notice of separation. Sets personal goals and direction, needs and development. Undertakes personal actions and behaviors that are clear and purposive and takes into account personal goals and values congruent to that of the organization. Displays emotional maturity and enthusiasm for and is challenged by higher goals. Prioritize work tasks and schedules (through gantt charts, checklists, etc.) to achieve goals. Sets high quality, challenging, realistic goals for self and others. Demonstrates the values and behavior enshrined in the Norms of Conduct and Ethical Standards for public officials and employees (RA 6713). Practices ethical and professional behavior and conduct taking into account the impact of his/her actions and decisions. Maintains a professional image: being trustworthy, regularity of attendance and punctuality, good grooming and communication. Makes personal sacrifices to meet the organization’s needs. Acts with a sense of urgency and responsibility to meet the organization’s needs, improve systems and help others improve their effectiveness. Achieves results with optimal use of time and resources most of the time. Avoids rework, mistakes and wastage through effective work methods by placing organizational needs before personal needs. Expresses a desire to do better and may express frustration at waste or inefficiency. May focus on new or more precise ways of meeting goals set. Makes specific changes in the system or in own work methods to improve performance. Examples may include doing something better, faster, at a lower cost, more efficiently; or improving quality, customer satisfaction, morale, without setting any specific goal. Willingly does his/her share of responsibility. Promotes collaboration and removes barriers to teamwork and goal accomplishment across the organization. Applies negotiation principles in arriving at win-win agreements. Drives consensus and team ownership of decisions. Works constructively and collaboratively with others and across organizations to accomplish organizational goals and objectives. Can explain and articulate organizational directions, issues and problems. Takes personal responsibility for dealing with and/or correcting customer service issues and concerns. Initiates activities that promotes advocacy for men and women empowerment. Participates in updating of office vision, mission, mandates and strategies based on DepEd strategies and directions. Develops and adopts service improvement programs through simplified procedures that will further enhance service delivery. Examines the root cause of problems and suggests effective solutions. Fosters new ideas, processes, and suggests better ways to do things (cost and/or operational efficiency). Demonstrates an ability to think “beyond the box”. Continuously focuses on improving personal productivity to create higher value and results. Promotes a creative climate and inspires co – workers to develop original ideas or solutions. Translates creative thinking into tangible changes and solutions that improve the work unit and organization. Uses ingenious methods to accomplish responsibilities. Demonstrates resourcefulness and the ability to succeed with minimal resources. Persuades, convinces or influences others, in order to have a specific impact or effect. “Sets a good example”, is a credible and respected leader; and demonstrates desired behavior. Forwards personal, professional and work unit needs and interests in an issue. Assumes a pivotal role in promoting the development of an inspiring, relevant vision for the organization and influences others to share ownership of DepEd goals, in order to create an effective work environment. Makes specific changes in the performance management system or in own work methods to improve performance (e.g. does something better, faster, at lower cost, more efficiently; improves quality, customer satisfaction, morale, revenues). Sets performance standards and measures progress of employees based on office and department targets. Provides feedback and technical assistance such as coaching for performance improvement and action planning. States performance expectations clearly and checks understanding and commitment. Performs all the stages of result-based performance management system supported by evidence and required documents/forms. Improves the skills and effectiveness of individuals through employing a range of development strategies. Facilitates workforce effectiveness through coaching and motivating/developing people within a work environment that promotes mutual trust and respect. Conceptualizes and implements learning interventions to meet identified training needs. Does long-term coaching or training by arranging appropriate and helpful assignments, formal training, or other experiences for the purpose of supporting a person’s learning and development. Cultivates a learning environment by structuring interactive experiences such as looking for future opportunities that are in support of achieving individual career goals. Gud am pwede pa share ng IPCRF /OPCRF for school heads..salamat…. good morning po! can i ask IPCRF for Administrative Officer II and Registrar for SHS. Salamat! please send me a copy of IPCRF for DPESS. Thnk u very much. can you please provide a sample of IPCRF for Administrative Assistant II. can you please provide a sample of IPCRF for Administrative Assistant II. thank you!!!! Can i ask a sample ipcrf for ADAS 2.thank you.. I noticed that there was no Form for REGISTRARS, PLEASE make it available for us SHS Registrars…Thank you! I noticed that there is Form for REGISTRAR,PLEASE make it available for us SHS Registrars…Thank you! Hello, could you give me a sample IPCRF for Senior High School Registrar? 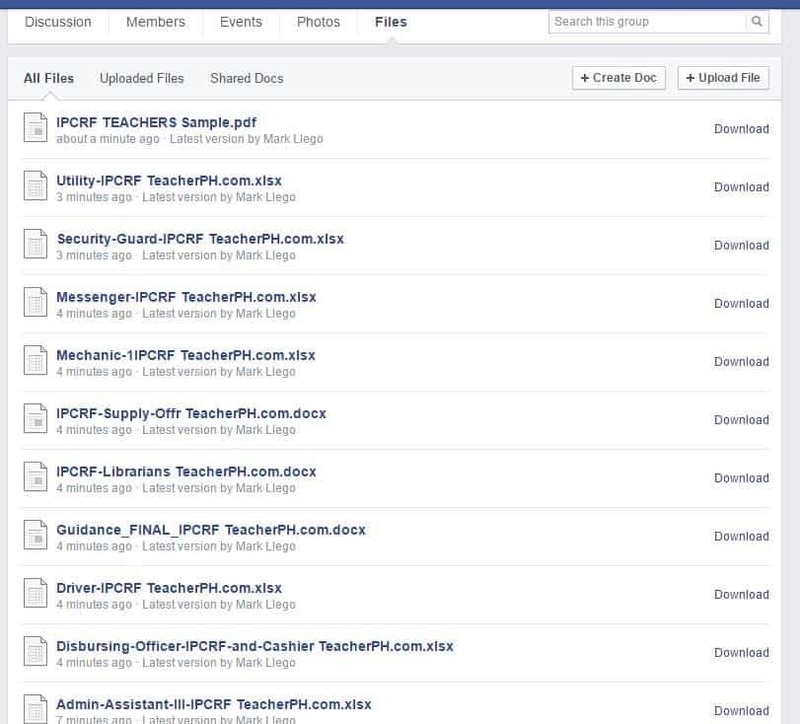 do you have sir sample of IPCRF for School Registrar?tnx..
Did you already got a sample copy of a School Registrar’s IPCRF? sir, please provide me a sample of IPCRF administrative assistant II. Thank you!!!! Hello Sir, may I ask po if meron na sample IPCRF for Registrar? Do you have IPCRF sample for registrar sir? Is there a sample of IPCR of a boy/girl Scout Coordinator? Is there any sample for registrar?